SAN DIEGO (KGTV) - One of the busiest intersections in San Diego is dealing with significant backups. 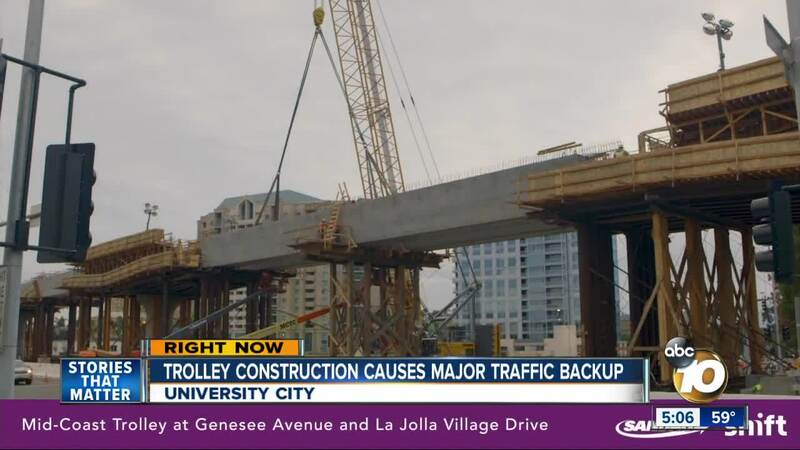 La Jolla Village Drive at Genesee in University City is closed because of trolley construction. At a crosswalk off of Genesee Avenue, crews made an opening underneath the construction for pedestrians to cross the street, but some say its just too dangerous. “This scares me. I can’t wait until it’s done,” says Brian Farrow. Farrow is an accountant in the area. He says he has to walk along Genesee Avenue and La Jolla Village Drive to different businesses throughout the day. He feels the construction is now a safety concern because drivers are eager to get through it. SANDAG crews say they are on schedule to reopening the road on Friday morning. “This is really the fastest, most efficient way to get this trolley over this intersection and not impact traffic for a long period of time,” says Project Director John Haggerty. Pedestrians say once the trolley expansion is complete they would still like to see fewer cars on the road. “If people who work in the area start using the transportation system, I think it would be a big help and alleviate the commute especially at the end of the day when everyone is trying to leave this area,” says Amara Tan, who works in the area. The full expansion is set to be complete in 2021. Drivers in the area can expect the busy intersection to reopen Friday morning by 5 a.m.